This London based fashion brand was founded by designer Gemma Shiel in 2011 and now it seems ever-expanding. The brand is 100% built upon Gemma’s quirky, bright prints that often have a little twisted sense of humor. The collections are notoriously colorful, cartoon-focused; always with an element of weirdness. They have found the perfect combination of nostalgic prints with and cool, streetwear silhouettes. So what do we have here? We have two young, super cool people; one on a pink backdrop, the other in pink hair. What’s not to love here I wonder. But to break it down, what I do love is how all online channels are built around these strong images, keeping the rest simple. You can’t go to their website and not be happy, it’s simply fun just to browse and look at. You want to see more. And you will! The images are incorporated everywhere, they have amazing product shots mixed up with fun still images, lookbooks, an updated blog and an instagram feed including their fans. Combined with their top-notch social media channels of – yes – more images. The essence of the brand – young, fun, bold, colorful – is incorporated in every little bit of online communication. 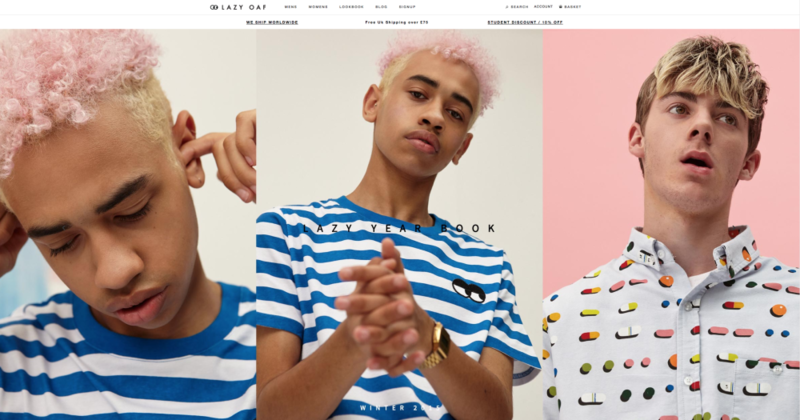 What can I say, I love Lazy Oaf.